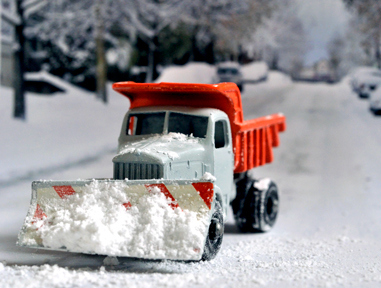 From early childhood, we are given toy cars to play with;which in turn fuels the imagination for fleeing to the open road. “It’s not just your car it’s, your freedom”goes the old slogan for the General Motors car company. It is a sentiment,which has firmly lodged itself into the American consciousness. 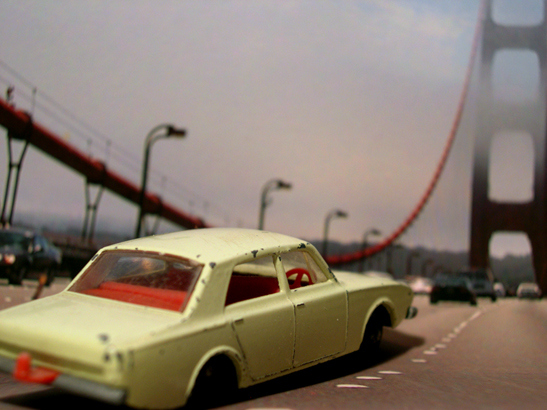 I began the photo series, “Size is Relative” thinking of theMatchbox cars as stand-ins for the real thing. I wanted to photograph them asthey might have been in the original advertisements; the beau ideal of the sleek sports car poised on the edge of aCalifornia cliff overlooking the ocean, the family sedan cruising through themountains, or a day at the beach with the station wagon- tailgate down. At the start, I chose the cars that mysiblings and I had played with when we were young. These cars had the patina ofage: some with chipped paint, one or two with a cracked windshield, and some withold mud in the tires from a day of off-road exploration. 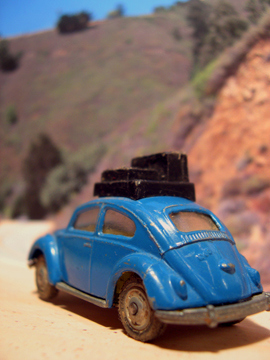 These were the cars that filled my mind ofimagined road trips. 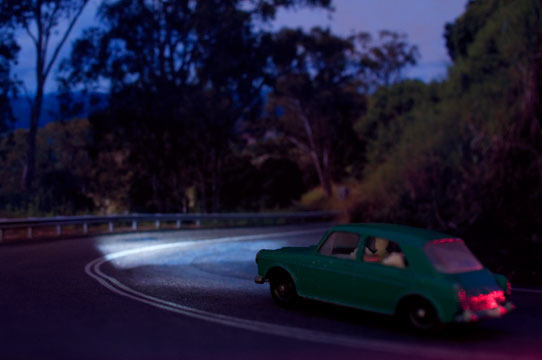 In the second part of the series, “Night Ride Home” Ishifted the focus from the cars themselves to the mood of the drive home. The return journey can be a bag mixed feelings - satisfaction of the day's excursion, tiredness from travel, a bit of sadness that the day has ended, or hopeful for a fresh start the next day. 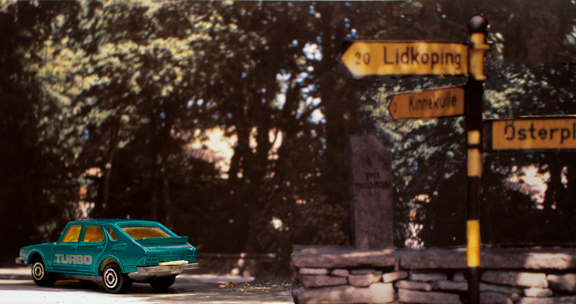 A note on my process: I shot the background images on a number of roadtrips. 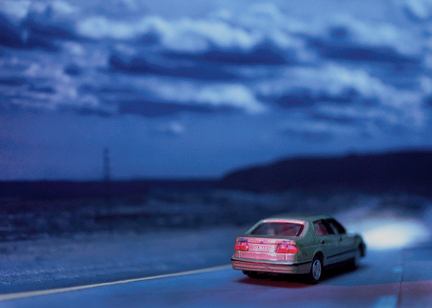 They are printed and used as seamless backdrops for the model cars to beplaced into and re-photographed in my studio. 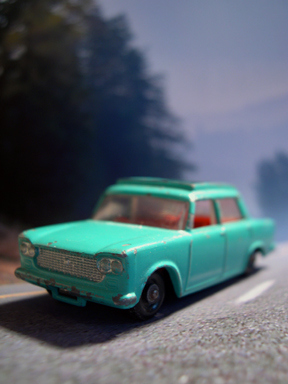 From early childhood, we are given toy cars to play with; which in turn fuels the imagination for fleeing to the open road. “It’s not just your car it’s, your freedom” goes the old slogan for the General Motors car company. It is a sentiment, which has firmly lodged itself into the American consciousness. 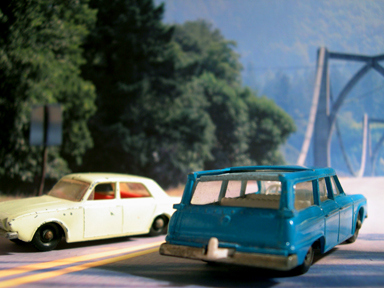 I began the photo series, “Size is Relative” thinking of the Matchbox cars as stand-ins for the real thing. I wanted to photograph them as they might have been in the original advertisements; the beau ideal of the sleek sports car poised on the edge of a California cliff overlooking the ocean, the family sedan cruising through the mountains, or a day at the beach with the station wagon- tailgate down. 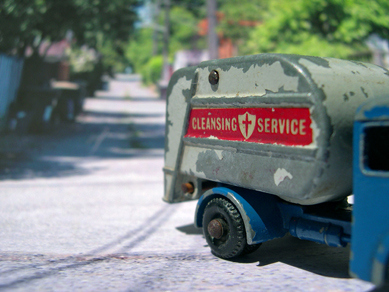 At the start, I chose the cars that my siblings and I had played with when we were young. These cars had the patina of age: some with chipped paint, one or two with a cracked windshield, and some with old mud in the tires from a day of off-road exploration. 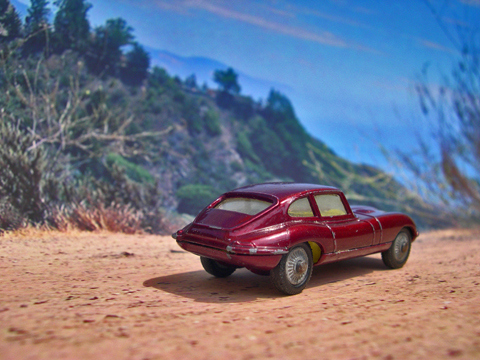 These were the cars that filled my mind of imagined road trips. 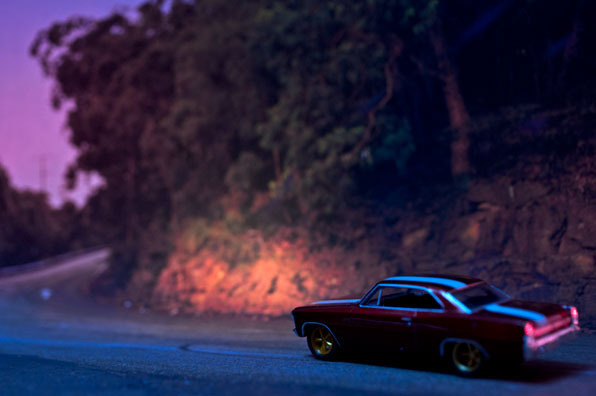 In the second part of the series, “Night Ride Home” I shifted the focus from the cars themselves to the mood of the drive home. 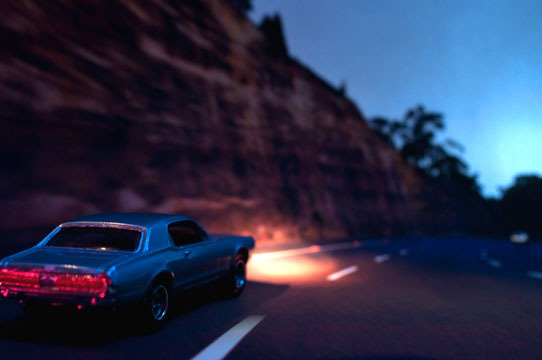 I shot the background images on a number of road trips. 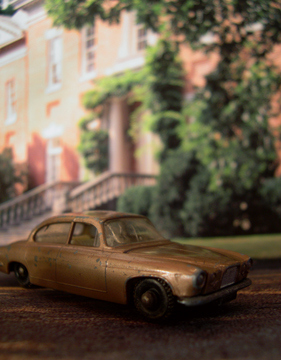 They are printed and used as seamless backdrops for the model cars to be placed into and re-photographed.